Celebrating an activity that is companionable as well as scientific ("I will miss these conversations. . .where I listen carefully/then answer/only with my eyes") and that fosters a special bond with the natural world, Yolen presents 17 melodious evocations of particular species and the ruminations they've prompted. Her images are in tune with her subjects, and her language is concrete, its simplicity often merely the surface of a more profound thought, as in "Time Piece": "Which is more fleeting:/the flicker/of swallow wings/in a field of insects,/the hover/of a hummingbird/over a flower's invitation,/or the footprints/of sandpipers/before an incoming tide?" Lewin's lovely watercolors, precise enough to serve for identification, provide a perfect backdrop--or, for those unfamiliar with the birds, a vivid sense of their character. A last page offers notes on most of the birds. 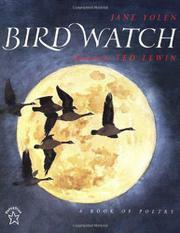 A book to bring nature- and poetry-lovers together.